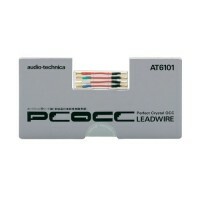 Audio Technica AT6101 Lead Wires Lead Wires AT6101 Cartridge to headshell PCO.. Audio Technica AT6106 Lead Wires Lead Wires AT6106 Cartridge to headshell PCO..
Ortofon LW 1000S Silver Leadwires The LW1000S headshell leads represent the best in conductivity ..
Ortofon LW 6N Copper Leadwires Ultra High Purity Copper wire LW 6N Ortofon LW-..
Ortofon LW 7N Copper Leadwires Music signal can be transmitted without any noise. LW 7N..
Ortofon LW 800S Silver Leadwires Transmits the very clear high tone signals, it brings the brilli..
Ortofon LW 8N Copper Leadwires Music signal can be transmitted without any noise. LW 8N..